YouTuber UpIsNotJump was so disappointed in the season six finale of The Walking Dead that he's set off on his own nostalgia trip. 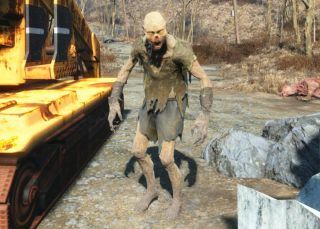 Some might just rewatch the first series, but recreating the four-minute season one trailer in the medium of Fallout 4 is an option too, I suppose. Here's the actual trailer for reference. It's a pretty accurate homage, barring the scenes featuring moving cars, which Bethesda's engine near enough refuses to do. Thanks to the tonal similarity of a zombie apocalypse and a nuclear apocalypse with zombies, Fallout is a ready canvas on which to mod Rick Grimes' sheriff outfit. UpIsNotJump's next Fallout 4 project is the Breaking Bad trailer, presumably making heavy use of the chem station.